To describe Wilson Yip’s glossy take on the formative years of Wing Chun master Ip Man as a biopic is being somewhat economical with the truth. The same misnomer could apply to other vaguely biographical sensationalist potboilers like Fighter in the Wind and Fearless. Yip’s passionate and patriotic drama closely resembles a companion piece for the latter, focusing on the second Sino-Japanese war and the subsequent hostilities facing the Chinese living in invaded Foshan. It even champions an outwardly familiar anti-Japanese sentiment, something Chinese filmmakers have been flogging since, well, the war. The role of Foshan is also symbolic, being the prosperous holy land for China’s most revered martial arts superheroes – the most famous being Wong Fei-hung. Obviously Ip Man’s backstory was nowhere near as colourful as depicted here (he wasn‘t even living in Foshan during the war). Wilson Yip abandons fact in favour of cicumstance to promote the Wing Chun master as China’s next martial messiah. It is perhaps telling that Ip Man’s grandson, Ip Chun, acts as consultant for the film. In reality, Ip Man is most famous for being Bruce Lee’s martial arts instructor. If you know a bit about your modern day kung fu history, you may also be aware of Ip Man being the first person to teach the general public about the closely guarded secret discipline of wing chun – a quick, close combat kung fu system. When we first meet Ip Man (played by Donnie Yen in his most comfortable setting), he is living as a peaceful family man, testing his skills with other sifus on Dojo Street but refusing to pass his secrets onto others. When the Japanese invade in 1937, Foshan is thrown into chaos and its residents, including Ip Man, are forced into slums. With depleting rations and insufficient medical care, the locals face the poisonous dilemma of either fighting back, aiding the Japanese war effort or, worse still, fighting among themselves. In one scene, a hotheaded northern kung fu rebel steals Chinese cotton supplies in an attempt to sell them back to their southern Chinese owners. It is this act which motivates Ip Man to teach his fellow natives the secrets of wing chun in an attempt to free his people from their brutal, slave-like conditions. 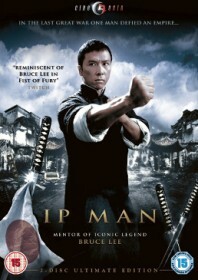 The film builds into an unfortunately predictable showdown of nationalistic intent where Ip Man is pitted in a bare knuckle brawl with the head of the Japanese army, a karate expert, who tastefully shows a deep respect for the martial arts and its honourable traditions, far unlike the snarling cartoon villainy of his subordinates. At the heart of the film is a keen admiration for not just Chinese martial arts but the masters who practice them. Sammo Hung’s faultless choreography steals the screen at every opportunity. For Hung, who has already made films detailing the founding fathers of Wing Chun (Warriors Two, The Prodigal Son), Ip Man is the next logical step in charting the system’s distinguished lineage. And Donnie Yen makes the role his own.